The Chromagenic color constancy algorithm estimates the light color given two images of the same scene, one filtered and one unfiltered. 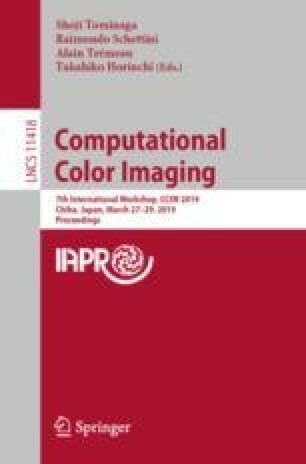 The key insight underpinning the chromagenic method is that the filtered and unfiltered images are linearly related and that this linear relationship correlates strongly with the illuminant color. In the original method the best linear relationship was found based on the assumption that the filtered and unfiltered images were registered. Generally, this is not the case and implies an expensive image registration step. This paper makes three contributions. First, we use the Monge-Kantorovich (MK) method to find the best linear transform without the need for image registration. Second, we apply this method on chromagenic pairs of facial images (used for Kampo pathophysiology diagnosis). Lastly, we show that the MK method supports better color correction compared with solving for a 3 \(\times \) 3 correction matrix using the least squares linear regression method when the images are not registered. GH, JVC, HG and GF have received funding from the British Government’s EPSRC programme under grant agreement EP/M001768/1, and funding from Apple Inc. GH, FM, MU and NT have received funding from Chiba University.